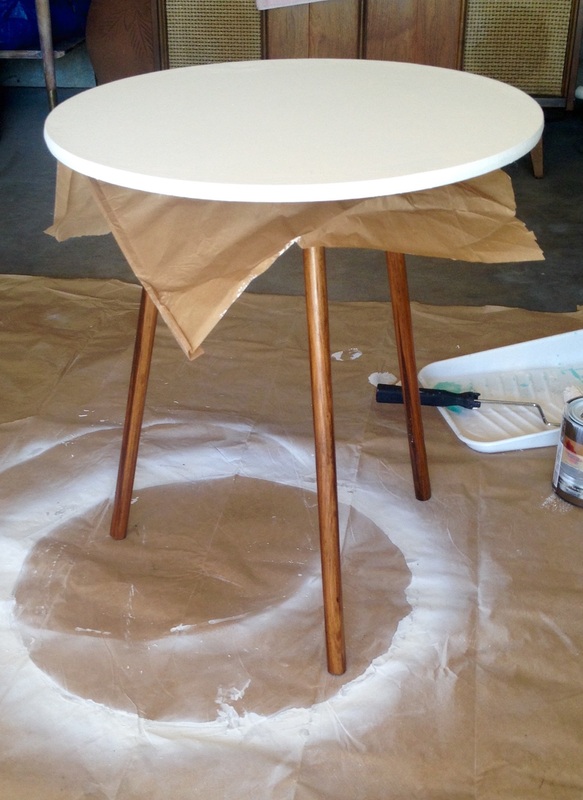 From Dumpster to Diva, a table transformation! Itching to revamp something, this little table was basically a throw away I decided to play with. Nothing vintage about it, this particle board decorator table was plain, ugly and pretty hopeless, so with little to lose I went to town. Before. An old, cheap throw away. I removed the legs, the only real wood component, and lightly sanded the pressed wood table top. It had some raised water damaged spots, so I knew painting wouldn’t be enough to fix it. The trim was plastic faux wood, also virtually impossible to do much with. I used Kilz Spray on Primer to prime the table top and trim. 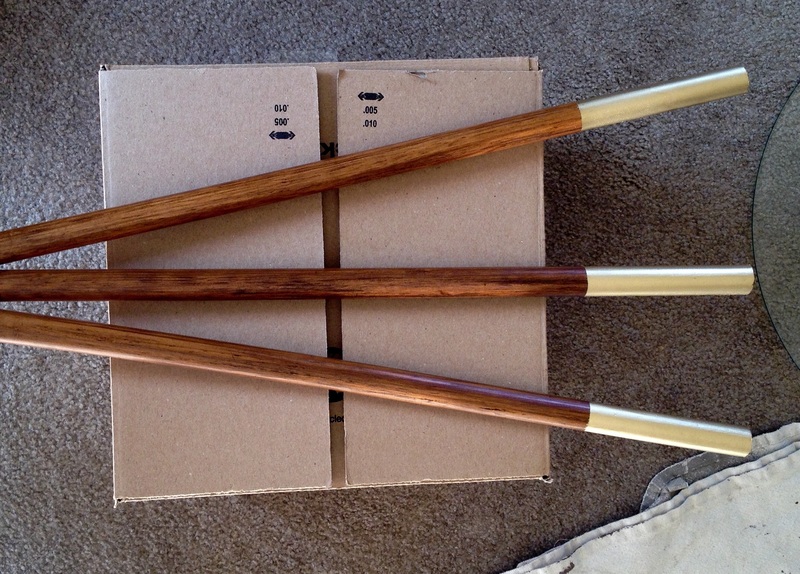 While that dried, I sanded the legs and used Minwax Gel stain in Hickory to stain them a lovely rich color. I’m obsessed with gel stain since it saved my last makeover project from disaster. It just goes on so smoothly, with little prep and still lets the gorgeous wood-grain shine through. I used Rustoleum’s Gold Metallic paint to spray the trim and edge of the table top. I did two light coats and 24 hours later I used Mod Podge to affix some awesome peacock paper I had to the table top. I did 3 layers of Mod Podge on top of the paper, and on the side trim to seal it. 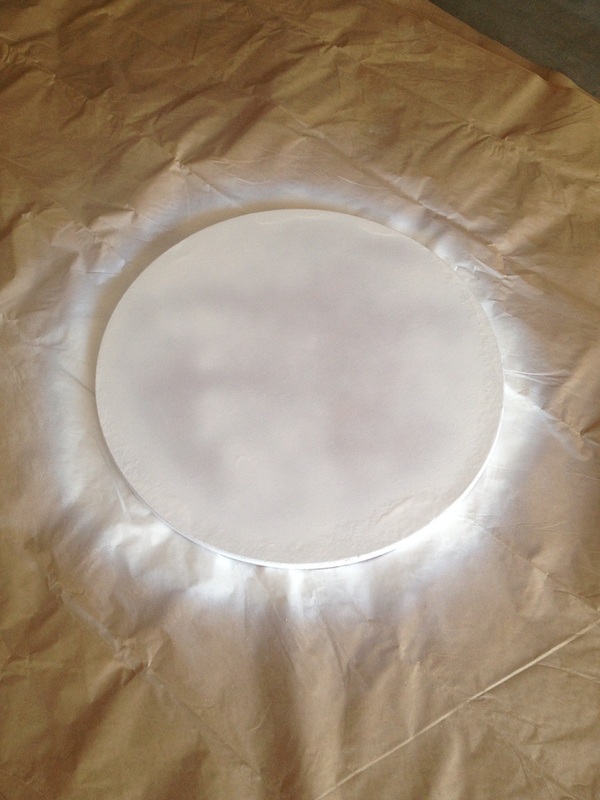 This was my first time using Mod Podge, and even though I had followed the instructions and used a credit card to smooth the paper after adhering it, I had a little freak out moment when the paper appeared bubbly with tons of air pockets after the first coat. Not really knowing what to do next, I left it to dry over night, and was thrilled to see that once it had dried, all bubbles had vanished. As a final little touch, I decided to pay homage to mid century table legs and I taped off the bottom of the legs and used the gold spray to create the look of metal ferrules (leg caps). A nice little cheat that turned out wonderfully. 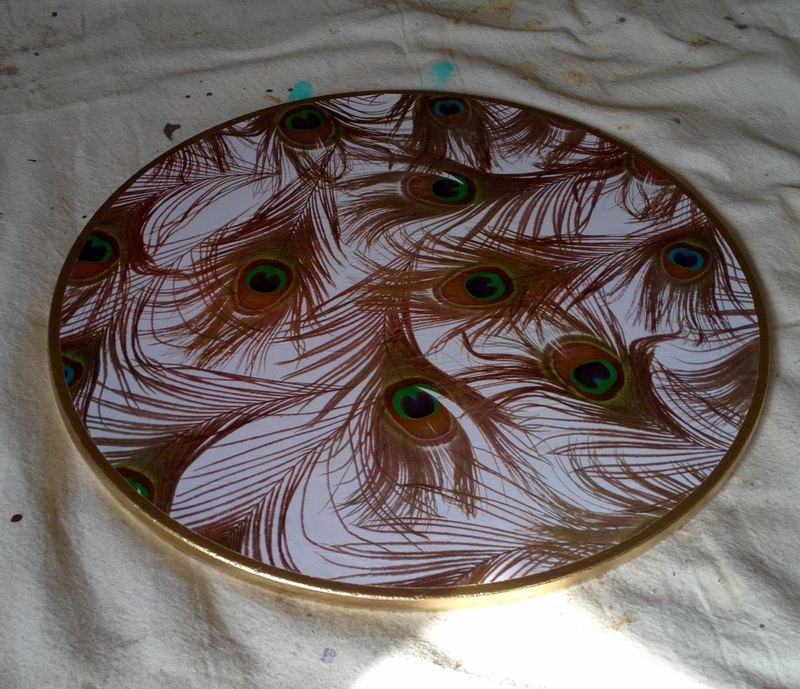 So there you have it, a quick and easy table makeover that turned the dumpster table into a fabulous, feathery showpiece. Once in a while I come across a makeover project that makes me think “oh, easy!” and this little sewing cabinet was no exception. I mean, lots of flat surfaces and straight lines, an easy strip, stain and seal and “Bob’s your uncle!” Well, no. Not this time. I loved this little table from the get-go, I hated it for moments, but in the end, I’m still enamored. That top drawer that flips around to hold bobbins and reels, so unusual and unique. Hard to pass up. It wasn’t the 50 years of peeling paint underneath that was work, it was the freshest coat that had been slapped on top recently to cover it that made this project a sticky, messy nightmare. And all those straight lines? Hmm, yes, well, except for the grooves on the trim. The MANY grooves on the trim. Not fun. And then there’s the drawer fronts. Yep, they’re flat alright, flat…but textured. With this odd layer of some kind of raffia or thatched laminate stuff. Stripping wasn’t even an option for those parts. So to say the prep was difficult, is an understatement. This wee gem took days of paint stripping, and for moments, a little piece of my soul. Then, those grooves…well, I tried everything from scrapers to wire brushes to steel wool to skewers. I finally got there, but in hindsight, sandblasting would have been the more effective option. Note to self. Next up, sanding. This part was the easiest of all. My snazzy Black & Decker orbital sander whizzed through and made the surface silky smooth in a jiffy. Things were looking up, because the last step in front of me, staining, is the easiest thing ever, right? I tried Minwax stain in Special Walnut, it’s a favorite of mine. And do you think this wood would take the stain? Oh puhlease, no way. Admittedly, there were two types of wood in this cabinet, and in my enthusiasm I didn’t consider the impact this may have on the staining process….which was evidently huge. So the stain on top looked great, on the sides looked OK, and on the front, looked awful. It was a patchy, streaky mess, no matter what I tried. It was at this point I went back to the trusty internet and this is where Gel Stain SAVED THE DAY. Gel stain, unlike traditional stain, is more like a paint. So it doesn’t soak into the wood, it sits on the surface. It’s a similar process, wipe on, wipe off, but the result was perfection. I used Minwax Gel stain in Hickory, and it was a rich, gorgeous tone that still let the wood grain shine through. Most importantly, it was even, smooth and consistent. Not a streak in sight. This stuff is GLORIOUS. The last step was the drawer fronts which, as mentioned earlier, were this weird textured stuff which I actually kinda liked the look of, but wasn’t able to strip or stain (or remove completely without having to replace the entire face of the drawers. More effort than I was willing to put in at this point). So I painted. I had some amazing aqua blue “Island Oasis” paint left over from a table makeover, so I used that. A couple of chrome drawer knobs later, and a coat of Minwax polyurethane to seal the whole thing, and the cabinet looks stunning. Pretty fancy, don’t you think? 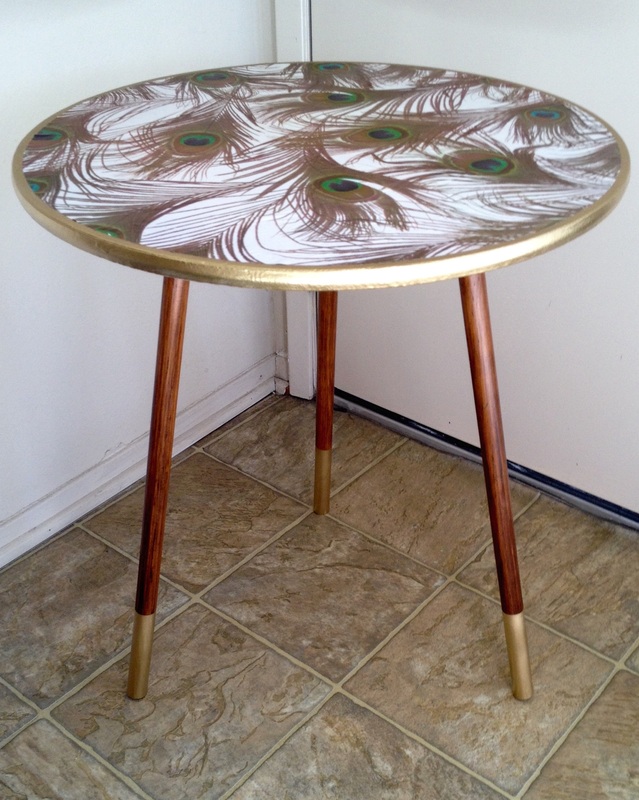 Sarah from Atomic Magpie scored this sweet but battle scarred end table and transformed it into a thing of beauty. Here’s how she did it. A few weeks back I found this beat up little end table on a local swap and sell site. Wedged in a corner, covered in office junk, paint scratched and dirty, and looking generally pretty sad. To many, not worth a second glance…but those legs! 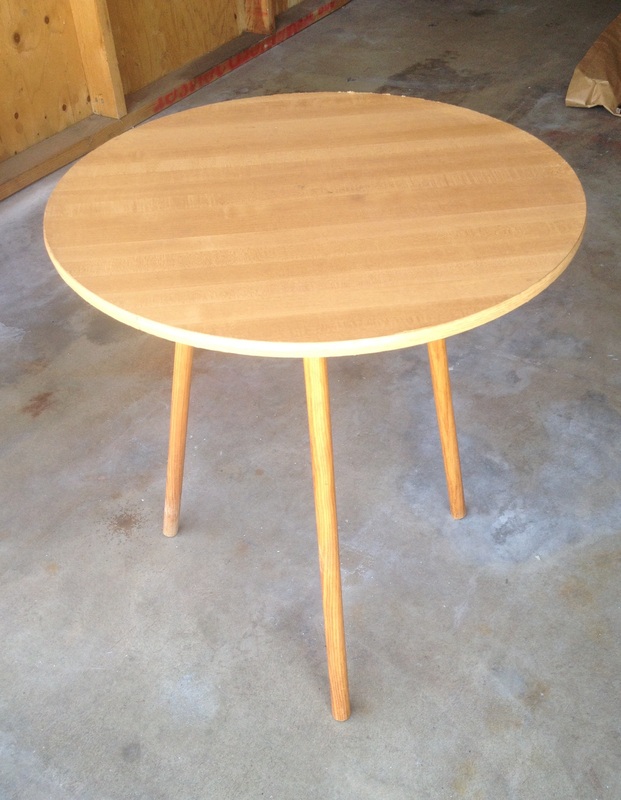 One look at the tapered legs, and this table screamed out “buy me! Save me! I am fabulous waiting to happen!” and I knew it had to be my next project. I determined pretty quickly that the table was solid wood, covered with layers of lousy paint jobs over the original varnish. So I set about stripping the layers of dirt, paint and stain off, and uncovered a few little surprises along the way. The first happy surprise I unearthed was the brass ferrules on the feet of the table. Covered in decades of paint, these beauties were the cause of great excitement. A staple of mid-century design, I adore brass tipped table legs, and these ones were fantastic. Next up, after stripping the top using an Eco-friendly, low fume paint stripper that I was able to use indoors (EZ Strip, Paint & Varnish Stripper) I found that I had in front of me a gorgeous mahogany table top, with a few water stains here and there, but nothing some sanding couldn’t remedy. The legs were a bit more work, requiring a lot of elbow grease, paint stripper and a wire brush. 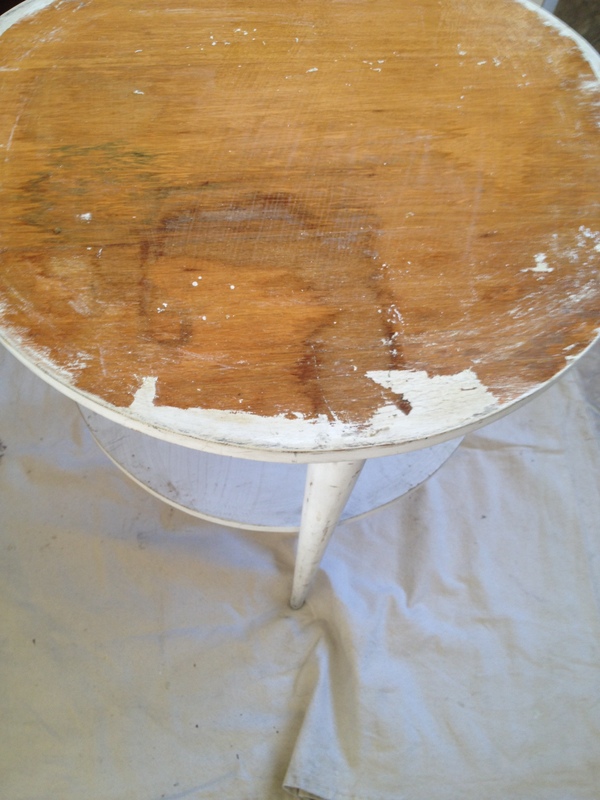 But it got there, and soon I had before me a stripped clean wooden end table with endless possibilities. I sanded the whole table using a handheld block sander with 100 grit sandpaper. I finished with a fine sandpaper (220 grit) The good condition of the wood, and the stunning grain, made it an easy choice for staining rather than painting. I chose Minwax Special Walnut as the stain, and used a lint free rag to wipe it on, and then off. I did about 6 coats to get the colour I wanted, and had a couple of minor hiccups along the way, mostly with the legs and some small spots of old varnish I had missed. A quick go over with sandpaper on those spots, a touch more stain and the problem was solved. A quick coat of Minwax polyurethane over the whole table, and the old ketchup trick to polish the brass ferrules, and the end result was quite stunning.